When it comes to the world’s finest homes, nothing is off limits. From ocean views to elevators, solariums and 24k gold details, these gorgeous jaw-dropping residences from the Coldwell Banker Global Luxury® marketing program are overflowing with everything you need to lead a lifestyle of complete luxury. Located in the gated community of Altos Del Mar, this stunning new tri-level contemporary Mediterranean rests on a 16,000 square-foot lot that puts the ocean at your backyard with direct beach and Atlantic Ocean views. The sprawling oceanfront oasis features seven bedrooms (including two private guest suites) in approximately 8,682 square feet of total living area. Inside, the finest designer finishes impress at every turn: an interior courtyard with fountain, marble floors, wood-beamed ceilings, 1st floor living room and kitchen, interior elevator and hurricane impact windows and doors. A sumptuous oceanside master suite with a private terrace overlooks the ocean. Entertain in the spacious 3rd floor living/family/dining areas with a custom gourmet kitchen and spectacular ocean views. And don’t miss the many outdoor highlights: summer kitchen with large covered terrace and bar, infinity pool and manicured grounds. An expansive rooftop terrace is also ideal for entertaining. 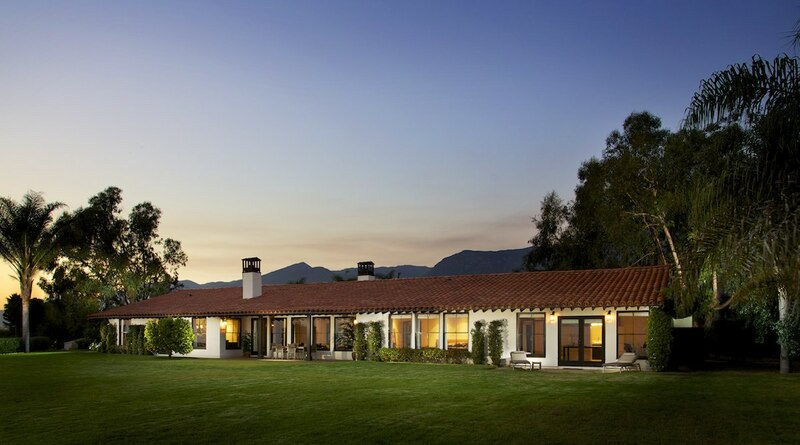 A magnificent coastal agricultural estate in Montecito beckons with unsurpassed ocean, island, coastline, and mountain views on more than 84 acres. The single level villa is beautifully appointed with four bedroom suites, a large office and separate guest casita. The spacious courtyard entry has a large swimming pool with spa, open and covered patios, tennis court. Additionally, The Ranch maintains the Williamson Act Agriculture Preserve status, which allows for a low property tax basis. The award-winning team of Gardiner and Larson Homes brought this exquisite stone Georgian to life on five magical acres in Greenwich. A sweeping driveway approach welcomes you into the residence, where you are greeted by a beautiful entry with rich paneling and archways, antique fireplaces and more custom details. Inside, you’ll immediately notice that the residence has been designed for entertaining. From the step down living room and dining room formally seating 12-22 guests to the handsome library with wet bar and Art Deco glass solarium, guests will be comfortable, no matter the occasion. Details, such as antique fireplaces and oversized French doors opening to the terrace, give the residence a grand feeling inside and out. A luxurious eat-in kitchen features a Viking cooktop and ovens, two sub zeros, three sinks and a peaceful setting that overlooks flower gardens. Then, there is the sensuous master wing: a fireplace, sitting room, 24k gold engraved verre eglomise mirror accents, two custom walk-in closets and two ensuite baths. Other thoughtful appointments captivate, such as a sun deck off of the second floor bedrooms, a third floor playroom/studio, an amazing garden level gym/golf/game/wine rooms. The outdoors are equally eye-catching and inspiring with a pool, spa, kitchen and cabana for poolside entertaining. This is one architecturally refined rendition of elegance and sophistication in Brentwood Park. 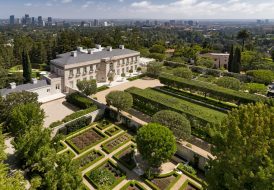 A lushly landscaped, private and gated 21,000 square-foot lot provides the backdrop for an open floor plan featuring volume, steel casement windows, pockets of disappearing glass and garden views from virtually everywhere. Five bedrooms and eight baths are spread across two expansive levels. The downstairs boasts a sun-filled living room, over-sized dining room with climate-controlled wine storage, fabulous kitchen and secondary kitchen with custom cabinetry and a beautiful family room with breakfast nook opening to a heated loggia with fireplace. The opposite wing has a guest suite and movie theater equipped full-featured projection system, elevator, library with oak shelving, two-car garage plus car lift for extra car and mudroom. Upstairs, there is a large entertaining loft, plus 3 on-suite bedrooms and a sumptuous master suite with two fireplaces, adjoining sitting room, his and hers closets, and exquisite bathroom. The estate grounds feel like a private paradise with a pool and spa. Standing in the shadow of the grandiose Richardsonian Romanesque-style Thompson House, it is impossible to feel anything short of awe. 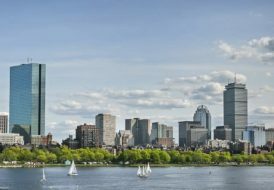 Designed in the 19th Century by Cobb & Frost for attorney John H. Thompson, this exquisite structure evokes a time of true masterpiece that is unparalleled in today’s market. 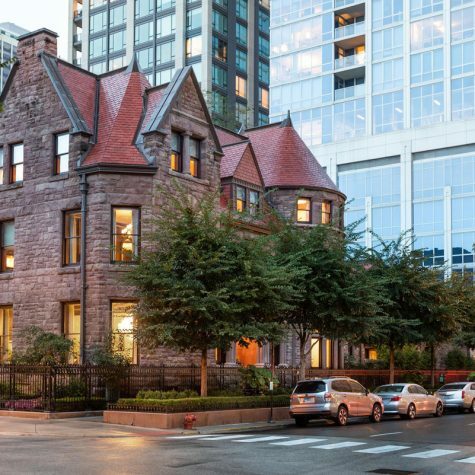 Lovingly and painstakingly restored, this nationally registered historic landmark is one of the most iconic homes in Chicago’s highly sought-after Gold Coast. Its enviable location provides gorgeous views of Washington Square, where you are just steps away from Lake Michigan and a short walk to Chicago’s Magnificent Mile. Inside this timeless home, you’ll be met with the efficiency of 21st century technology complemented by high quality craftsmanship: custom millwork, silk wall-coverings, marble floors, stained glass windows, rich wood paneling and mahogany hardwood floors. 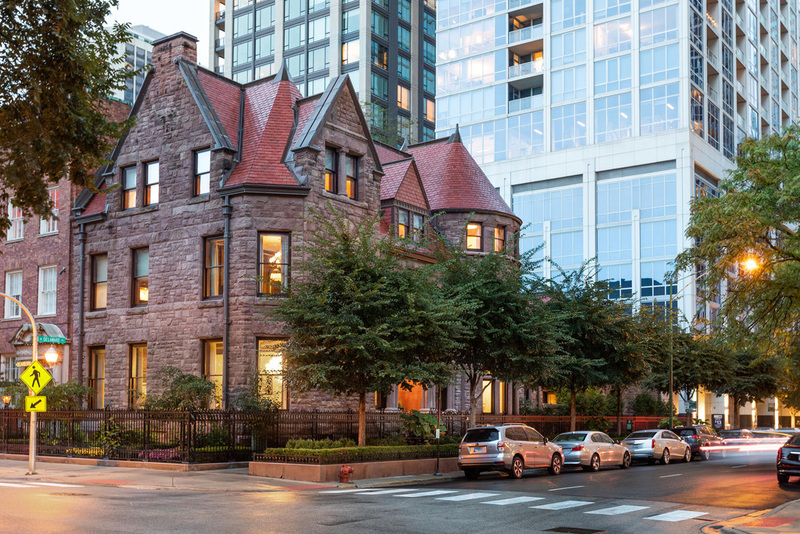 Experience true gentility and sophistication, and own a piece of Chicago history with a property that was built to enchant for centuries. The Beach House stays true to its name with 90 feet of prime beach frontage on Maui’s world renowned Keawakapu Beach. 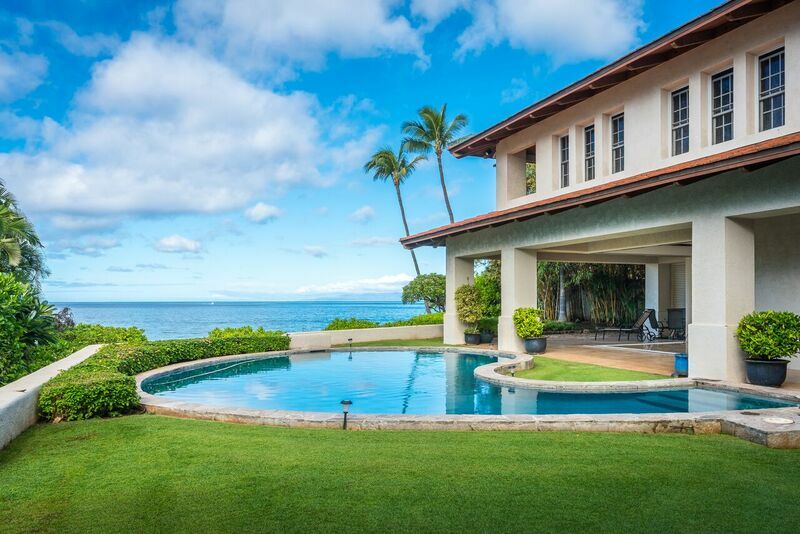 Hawaiian beach living consists of 5,468 square feet interior living area, a private pool area and extensive covered lanais. Enter the courtyard through the private electronic gated entry that features an amazing 100-year-old monkey pod tree and three-car oversized garage. When you step inside the beachfront residence itself, you’ll walk through the double 9-foot custom African Mahogany doors and into the 20-foot high foyer with circular staircase leading to the owner’s suite with stunning beach and ocean views. The amenities of this three-bedroom, two-and-one-half bathroom residence (with a possible expansion to six bedrooms and five and a half bathrooms with Maui Country approval) include high ceilings throughout, travertine and African hardwood flooring, pocketed glass sliding doors, custom kitchen cabinetry and white kitchen counter tops. Beachside, watch the humpback whales breach with their newborns. Enjoy your fresh water pool or walk through your private beach gate to the white sand Keawakapu beach for a stroll. 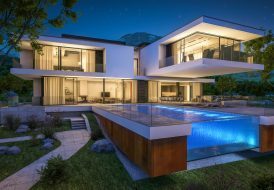 This multi-level new construction Pacific Palisades residence combines classic detailing and quality finishes with an open, contemporary floor plan that invites gatherings large and small. Extraordinary indoor and outdoor living spaces are set on approximately 1.8 acres of mature cyprus, palms, oaks, and other landscaping. Refined interior treatments include vintage tin and hand-coffered wood ceilings, floor-to-ceiling windows and disappearing doors, and premium limestone and hardwood flooring. There are two full kitchens, a humidor, grand bar, home office/library and screening room. Four bedrooms on the upper floor encompass a luxurious master suite with lavish bath and private view deck. A verdant, private setting manifests in a 40-foot hanging garden, detached home office/guest house, 20-foot custom-made exterior dining table and Island Stone pebbled pool and spa. There are many other modern-day conveniences, including a three-car garage and large motor court plus second driveway for parking and maintenance. Nestled on nearly an acre in The Estates At The Oaks — one of the most private gated communities in Calabasas, this grand and magnificent custom residence developed by architect Dan Lang spans almost 15,000 square feet and encompasses another 3,000 square feet of outdoor patios and pavilions. The home’s East-West position allows for perfect sunsets. Customized with top-of-the-line luxury, the expansive interiors harmoniously balance scale and detail in every room: crystal Swarovski chandeliers, Phylrich plumbing fixtures, 24-carat gold fixtures and THG Paris faucets, hand-cut 24-inch marble floors, amazing double staircase, gold plated finishings, hand-carved walk-in fireplace, huge master suite, outfitted walk-in closets, sitting room, wood paneled office, spa tub, steam shower with hand paintings by Kavarly. An entertainer’s paradise, the residence impresses with multiple balconies, five fireplaces, formal dining space that seats 22 guests and a fully equipped gourmet kitchen. For more casual dining, there is an incredible customized breakfast area with a richly detailed painted ceiling. Outdoors, prepare to be wowed with an amazing swimming pool, covered summer kitchen with charcoal BBQs, pizza oven, heaters in ceilings, fire pit, catering access, two bathrooms, gym and more. 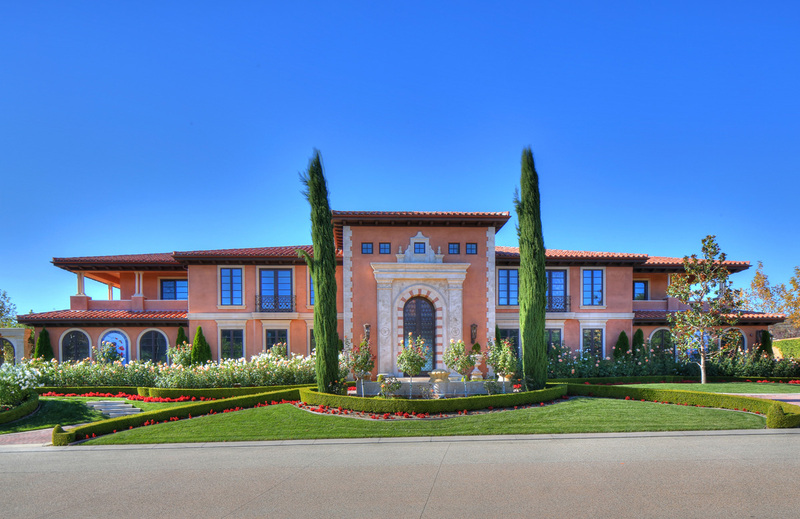 This estate is truly a masterpiece in the best of Calabasas. This opulent and regal point lot estate in Fort Lauderdale features 437 feet of deep water frontage and more than 170 feet of full service, protected mega yacht dockage for quick and easy ocean access. 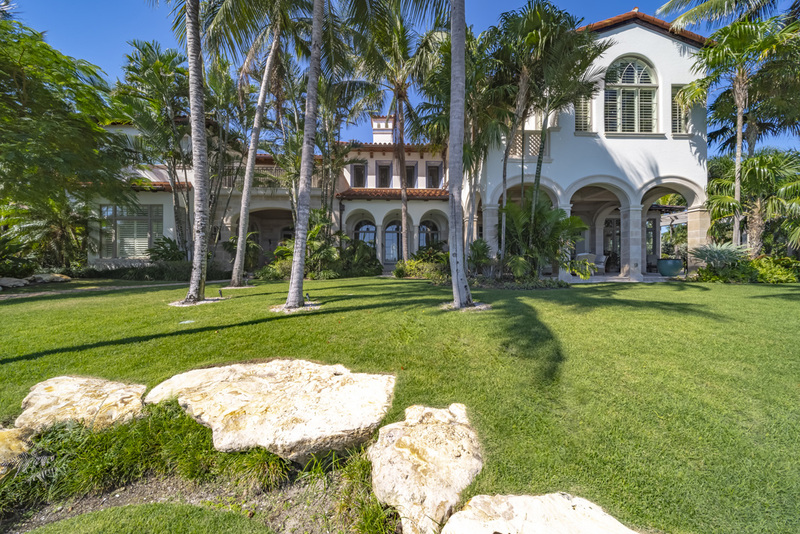 One of the most spectacular properties in all of South Florida, the residence astounds with its views. You are welcomed by rolling lawns and huge shade trees, which grace this extraordinary property as you drive thru the gate to the porte-cochere. Inside, the interiors were clearly meant for entertaining: a fully equipped chef’s kitchen, formal dining room, and other public spaces feature exquisite details and the finest finishes, including magnificent limestone floors, beamed ceilings, spectacular wine cellar, elevator and fireplace. A stately master suite captures attention with a full marble bath. Located in the historic Rio Vista neighborhood, the residence is also conveniently located to downtown Fort Lauderdale, shopping, fine dining, nightlife, air, sea ports and major highways. This Newport Beach stunner commands distinction sight unseen, yet the caliber can only truly be appreciated firsthand. First, it begins with the home’s sought-after location nestled between the beach and the bay with approximately 90 feet of frontage spread across three lots. Designed by renowned architect Robert Sinclair, built by Patterson Custom Homes, and finished by Blackband Design, the home has a prestigious pedigree that represents innovative design and quality construction. The envy of every passerby is evoked with a towering façade and backyard fit with luxurious amenities including cooking area, fire pit, bay beach present at most tides, approximately 57-foot-long pool with underwater speakers, and new dock that can accommodate a minimum of four vessels. 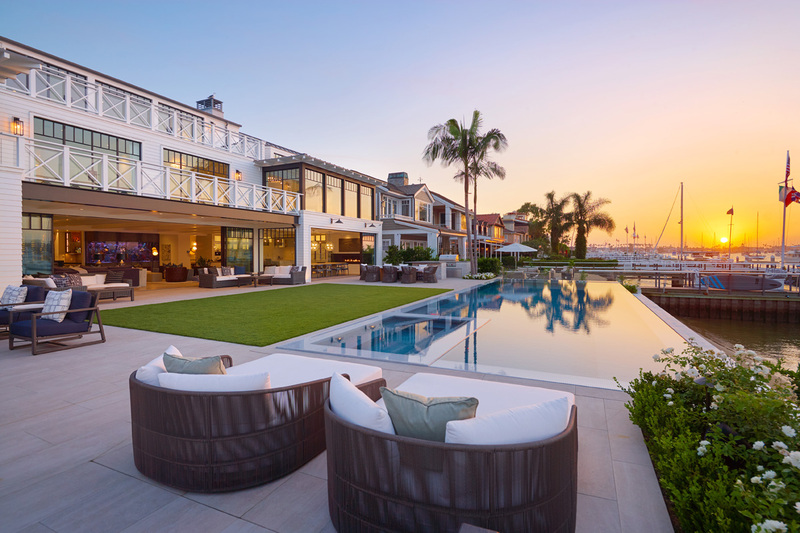 Approximately $1,000,000 in Riviera Bronze windows and doors blends the outdoors and indoors where sophisticated city living meets the comfort and casualness of the coast. Five bedrooms, two game rooms, two bars, two gourmet kitchens, executive office, craft room, theater, gym, mudroom, and sauna are complemented by striking design elements including precision millwork, a floating, underlit staircase beneath oversized skylight, fireplace within a approximately 16-foot stone hearth and mantle, and 1,100-gallon aquarium. State-of-the-art technology operates the home: Whole-house automation and security with surveillance, six HVAC compressors, four-stop glass elevator, five-car garage with EV plugs-ins, three Tesla solar batteries, and 16 kW Panasonic solar panels that can perpetually power the critical elements of the house during power outage.